Crystal Palace surprised Pep Guardiola's men in front of their own fans at the Etihad Stadium, winning with a 3-2 scoreline. 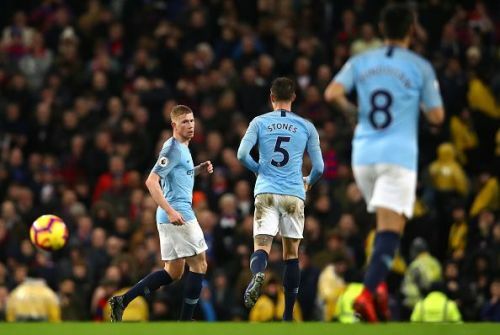 Kevin De Bruyne made his comeback from his knee injury and provided a valuable goal, but his effort ended up a mere consolation. Manchester City started the game in typical fashion, dominating the midfield. Their superstar midfielder, Ikay Gundogan, broke the deadlock in the 27th minute of the match. Pep Guardiola and co. were in a comfortable position until Jeffrey Schlupp scored the equalising goal in the 33rd minute of the match. Andros Townsend enhanced their lead in the 35th minute with a stunning volley, largely against the run of play. In the second half, Manchester City tried to dominate the game. Their other defensive mistake helped Palace extend their lead as Milivojevic converted a smartly taken penalty, after a foul from Kyle Walker in the box. Manchester City did everything right afterwards, but they lacked the cutting edge. Kevin De Bruyne came on the field in the 62nd minute of the match, replacing Delph. In the 85th minute, his intended cross found its way into the Palace goal, giving City hope, but it ended in disappointment for the Sky Blues. Gabriel Jesus missed a few valuable chances as City took 19 shots, with only 5 on target, while Palace were very efficient in front of goal, with 3 out of 5 shots on target and one hitting the post. Liverpool are currently on the top of the Premier League table with 48 points. The defeat against Crystal Palace has resulted in a 4-point difference between Liverpool and City. This could throw City's title hopes into jeopardy, with a difficult run of fixtures coming up. Here is how fans on Twitter reacted to the game. Crystal Palace are beating Manchester City 3-1! Manchester City 2 Crystal Palace 3. Manchester city & Chelsea have lost because they are paying tribute to Jose Mourinho’s sacking by ManchesterUnited.